If it seemed fine for you, then you're not having the problem. You can't miss it. Yes, my setup looks exactly like that. What version are you running? 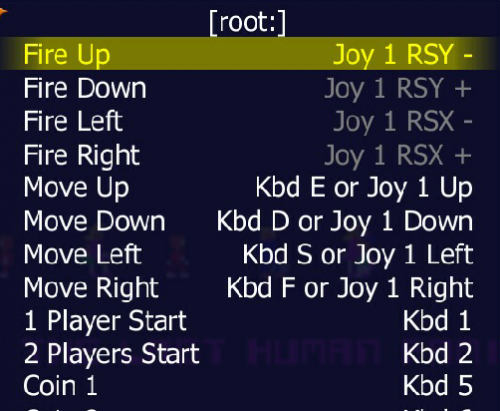 Found another guy with identical in game behavior with his controller, but his only does it with Retroarch and works fine in MAME itself. He's on .177. Not that it should make a difference, my controller is the 360 (vs One). Just tried Robotron again and confirmed all's good here. Was able to shoot all 8 directions. And after playing it for more than just a few seconds this time had an "oh crap! I remember playing this game in the arcade!! ..moment. Sorry, no help here. I remember having this problem at one point, but I can't remember exactly how I fixed it. I'm pretty sure it only happened in retroarch with a mame core like the person you found. I've since switched to using the standalone mame and not had any problems. I'm assuming you're not running .206 via a retroarch core? I'm running .201 personally fwiw.